What comes to mind at the first mention of “sticky rice”? You probably guessed it right. 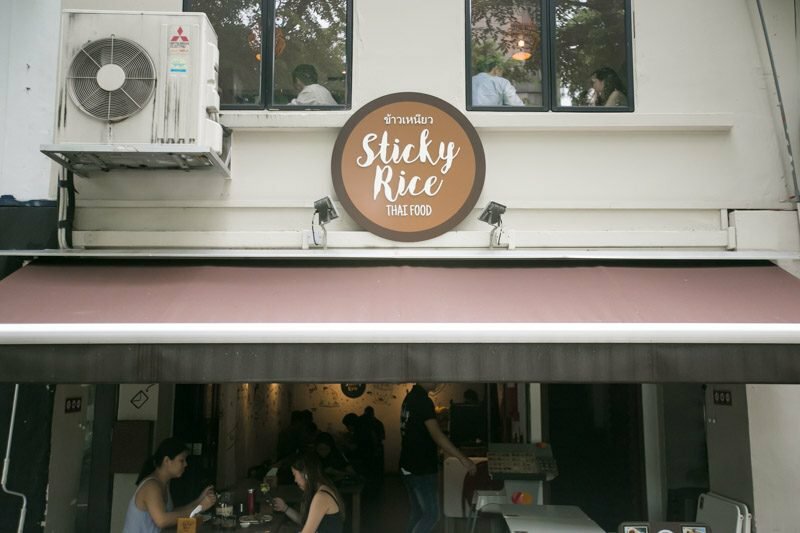 Located in the heart of Bugis along Bali Lane, Sticky Rice is known for serving up delicious plates of halal Thai food. With just over 30 seats, it does get crowded during lunch and dinner time. We’d suggest calling ahead if you’re heading down in a large group. A Thai meal is never complete without a cup of cha yen and it was the first thing we ordered while deciding what to eat. The Thai Iced Tea ($3) was thick and not overly sweet, making it a quick favourite. I’ve been addicted to cha yen since my first trip to Bangkok in 2016. To curb the sweltering Bangkok heat, I drank multiple cups every day. Likewise, this ice-cold cup of Thai milk tea was perfect after the five-minute walk from Bugis MRT in the scorching sun. Another Thailand classic is tom yam soup. We tried the Seafood Tom Yam Soup ($7.50) as I love how seafood adds a certain sweetness to the soup. Spicy and sour, the tom yam soup was light and did not overpower the delicate flavours of the seafood. There was a generous serving of fish and prawns in the soup, with more than enough for everyone at the table to try. For those who are allergic to or dislike seafood in general, there is a chicken version available. However, we felt the chicken would not be as quick to absorb the light taste of the soup. On the other hand, the Green Curry ($7.50) was the perfect complement for those who prefer chicken over seafood. This creamy broth came with chicken and eggplant and every mouthful was an explosion of a myriad of flavours. Cooked with a mixture of chillies and spices, it sure packed a punch. However, the coconut milk subdued most of the heat, allowing us to slurp the soup without choking on the spice. For just $7.50, we were pleasantly delighted at the amount of tender chicken meat in the bowl. However, the taste of green curry is rather robust, and I’d suggest getting a bowl of rice to accompany this dish. Having devoured the tom yam soup and green curry so quickly, I did not realise how spicy it was until I’d stopped eating. Then again, my spice tolerance is rather low. But I had to get something to quench my thirst and the Fresh Coconut ($5) seemed like the perfect choice. For $5, I was expecting a much bigger coconut with more juice. But size aside, the coconut juice was sweet and refreshing. It sure quenched my thirst and extinguished my flaming tongue. While waiting for the remnants of the heat to abate, we opted to try the Garlic Chicken Wings ($8.50). Topped with crispy chopped garlic and served with a sweet chilli sauce, it was instinctive to eat the chicken (without the chilli) as I did not want my tongue to burn up so quickly. What I loved most about the chicken wings was how it had been chopped down the middle. Cooked to perfection, the chicken slid off the bone rather easily and the mess that usually came with eating chicken wings in public was cleverly avoided. After much assurance that the chilli dip was more sweet than spicy, I ventured forth to try the chilli dip. The heat from the chilli kicked in much later, but not before giving that additional sweetness that reminded me of the honey-garlic chicken wings that I’m obsessed with. If you’re on a budget, I’ll recommend you try the Basil Rice Set ($7.50). Fragrant rice served with minced chicken that has been stir-fried with chilli and basil and a sunny side up egg, I’d say it’s assuredly value-for-money. The egg was slightly on the oily side, but its runny yolk alleviated any distaste I’d had about that oily surface. The best part of the runny yolk? It abated the spiciness of the minced chicken, adding a creaminess that countered the saltiness of the chicken. We were just about to order dessert when the ‘Mama’ Salad ($6.50) caught our eye. ‘Mama’ is basically the brand of instant noodles Thailand is famed for. Having grown so used to eating ‘Mama’ with its classic creamy shrimp tom yam soup base, having it offered as a noodle salad was a unique alternative; an alternative I was curious to try. Cooked with prawns, minced chicken and onions then tossed in a chilli-lime dressing, it was refreshing to the palette. I wish I’d had this before all the other items on the menu as it sure whetted my appetite. I ended up devouring more of this dish that I had previously expected. I had to control myself from slurping every last strand of noodle as I love authentic Thai desserts. I could not decide between my two favourite Thai desserts — mango sticky rice and coconut ice cream. Thankfully, Sticky Rice is well aware of this constant dilemma and their Mango Sticky Delight ($9) offers the best of both worlds. Sweet from the mangoes and ice cream, savoury from the coconut cream, warm from the sticky rice and cold from the coconut ice cream, all that’s left was a sour element to make this the perfect end to a hearty meal. However, I’d live with what I get and the Mango Sticky Delight certainly was a delight. Despite being a halal establishment, Sticky Rice retained the authentic Thai flavours I remember from my previous trips to Bangkok and will definitely give this a thumbs up for gatherings with your friends.